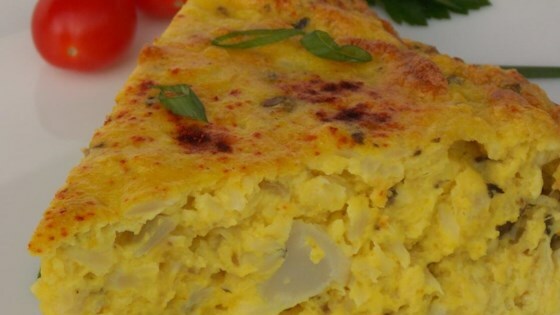 "This is a great quiche recipe - high in protein, which we need every day, especially as vegetarians. It is quick and relatively easy to make. All good cooks can adapt this recipe to their own requirements and availability of certain ingredients - but it tastes the best using the ones I have suggested here. If the ingredients are organic, they will be that much better." Place a steamer insert into a saucepan and fill with water to just below the bottom of the steamer. Bring water to a boil. Add cauliflower; cover and steam until tender, 5 to 7 minutes. Cool to room temperature. Blend cauliflower, mushrooms, and green onions in a blender under chopped, yet still chunky. Separate egg yolks and egg whites into 2 separate bowls. Beat egg whites in a bowl using an electric mixer until medium peaks form. Combine half-and-half, butter, and flour together in a saucepan over low heat; cook and stir until white sauce is thickened, about 5 minutes. Cool slightly. Stir white sauce, Parmesan cheese, cauliflower mixture, egg yolks, turmeric, salt, pepper, and curry powder together in a bowl; gently fold in egg whites using a spatula or wide knife. Pour egg mixture into a glass baking dish. Sprinkle paprika over egg mixture. Bake in the preheated oven until golden brown and set in the middle, 30 to 35 minutes. Watch how to make this savory egg pie in four easy steps. Any variety of cheese can be substituted for the Parmesan cheese. Cayenne pepper can be substituted for paprika. Followed Baking Nana's suggestions and adjusted recipe to call for 1/2 the cauliflower head, 3 eggs and added grated cheese before baking to the top. I made it and my family loved it and I was asked to do it again. Absolutely delicious. This was awesome i made it and it turned out really well.